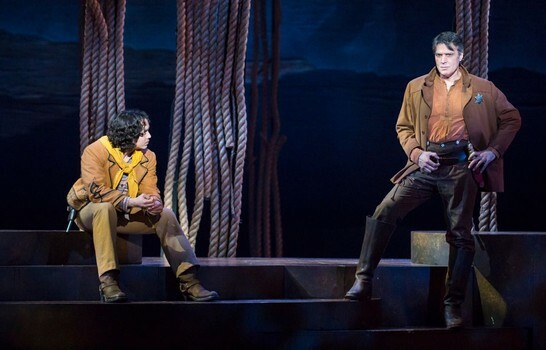 The 5th Avenue Theatre managed to present a classic and create a new musical with its production of “Paint Your Wagon” that closes June 25. Since 2001, the 5th has sent nine works first presented on their stage to Broadway: “Disney’s Aladdin,” “First Date,” “A Christmas Story,” “Scandalous,” “Shrek,” “Catch Me If You Can,” “The Wedding Singer” and Tony Award-winners “Hairspray” and “Memphis.” Many of the works developed on their stage also have become staples of the larger regional theaters. Executive producer and artistic director David Armstrong is not just a fan of creating new musicals. He’s equally fond of the “Golden Age” powerhouses created by Rogers and Hammerstein or Lerner and Loewe. New productions of these classics, often with non-traditional casting, are a regular part of the 5th’s season. In Lerner and Loewe's “Paint Your Wagon,” a sweeping, stirring score about the California Gold Rush married a plot that proved problematic for today's producers. A lackluster movie version, mostly known for proving Clint Eastwood wasn’t meant to be a musical star, didn’t add anything to the reputation of “Paint Your Wagon.” With the agreement of the Lerner and Loewe estates, the 5th and its producing partners set out to create a new book designed to appeal to 21st century audience looking for a more multicultural experience. Justin Gregory Lopez, who has played Latino character Armando since the revised script’s stage readings three years ago, loved that his character is now set up to be “very well educated. He’s based on the earliest Spanish settlers and comes from a well-to-do background.” There’s more than a little irony in many of Armando’s scenes as he copes with “his California” being overrun by white settlers in 1849. Other characters include Chinese immigrants, poor Irish, and both free African-Americans and those still in held in slavery. It also become one more musical export for the 5th. With a script nicely tailored for today’s theaters, this production becomes another work launched in Seattle that can travel well. “Paint Your Wagon” will play Aug. 9 to 21 at St. Paul's Ordway Theater. In its next season, in addition to several Northwest premieres and remounting some classics, the 5th will launch the world premiere of “Romy & Michele’s High School Reunion” (June 8 to July 2, 2017). Based on the 1997 cult comedy, it will be the 18th new musical developed at the 5th. More information on the company’s 2016/17 season can be found at their website.